Congress faces several impending deadlines as the year draws to an end, including a key healthcare program and a new Obamacare tax set to take effect Jan. 1 which would be a tax increase under Republican rule. With the tax reform hurdle nearly cleared, sources on Capitol Hill say they expect another legislative package to emerge before the end of the year that will knock out a list of last-minute priorities, including the Children’s Health Insurance Program and tax extenders. A key element up for debate in the expected legislative package is the health insurance tax, a tax on health insurance companies that takes effect Jan. 1 and that would raise premiums significantly. The Congressional Budget Office (CBO), estimated that HIT will cost $12.3 billion in taxes next year and $145 billion over the next ten years. Just today, a senior citizens group launched a second television ad in their $500,000 ad campaign against the tax. The health insurance tax did not make it into the latest tax reform package, but Wisconsin Governor and former presidential candidate Scott Walker has come out against the tax. 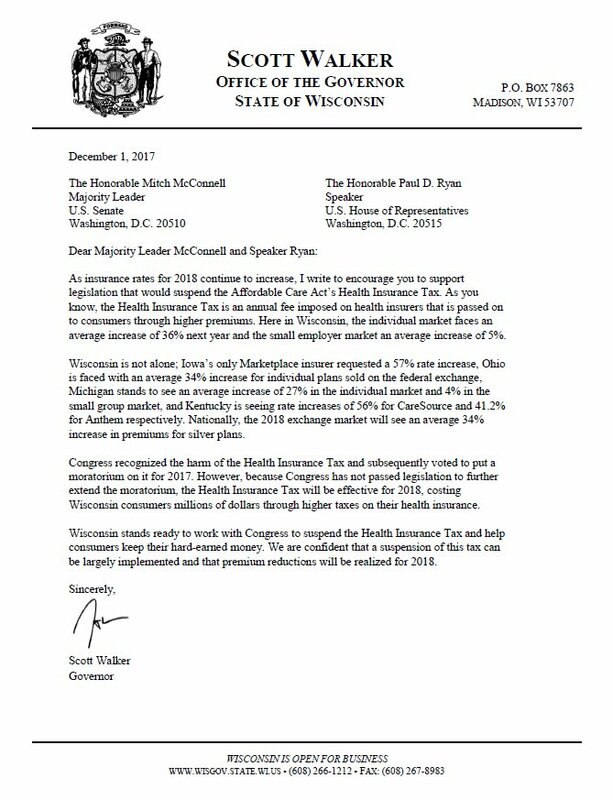 “Here in Wisconsin, the individual market faces an average increase of 36% next year and the small employer market an average increase of 5%,” Walker wrote in a public letter last week. A study from the Winston group found the majority of Americans support action to stop the tax, which is expected to raise premiums by 2.6 percent on top of the already soaring premiums under Obamacare. Congress has also yet to reauthorize the Children’s Health Insurance Program which insures about 9 million children. The funding expired Sept. 30, and supporters hope Congress will reauthorize the program before the end of the year. Another Obamacare tax, the medical device tax, places 2.3 percent sales tax on certain medical devices like MRI machines and pacemakers.